I've just learned via my colleagues at the Positive Justice Project in the US, that The Assault with Bodily Fluids Bill (LB226) introduced into the Nebraska State Legislature by Senator Mike Gloor recently passed into law with no amendments. For further background on the bill, and Sen. Gloor's motivation for introducing it, read this excellent piece from Todd Heywood in The Michigan Messenger. This latest development is extremely disappointing, and suggests that the trend of passing new laws that inappropriately criminalise people with HIV (and, sometimes other blood-borne infections such as hepatitis B or C) in a misguided attempted to protect police or other public safety officers is not reversing. A similarly unscientific and stigmatising bill – proposing mandatory testing and/or immediate access to medical records of anyone who exposes their bodily fluids to an emergency worker – has recently been proposed in British Columbia, Canada. Read this letter from the BC Civil Liberties Association about why the bill provides a false sense of security and may well be unconstitutional. 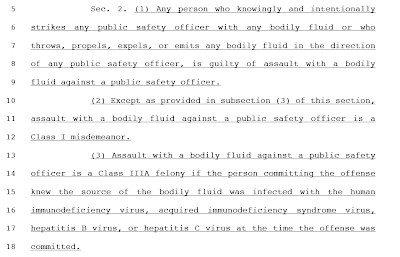 This Friday, February 4th, the Nebraska State Legislature will debate The Assault with Bodily Fluids Bill which would criminalise striking any public safety officer with any bodily fluid (or expelling bodily fluids toward them) and includes a specific increase of penalty to a felony (up to five years and/or $10,000 fine) if the defendant is HIV-positive and/or has Hepatitis B or C.
The Bill ignores the fact that HIV cannot be transmitted through spit, urine, vomit, or mucus; punishes the decision to get tested for HIV; and will not keep public safety officers safer, but rather will reinforce misinformation and stigma about HIV. None of the actions criminalised in this Bill pose a real risk of HIV transmission. Spitting while HIV-positive poses no risk of HIV transmission. The Centers for Disease Control has unequivocally stated that spitting cannot transmit HIV. Other “body fluids” identified in the Bill - including mucus, urine, and vomit, absolutely cannot transmit HIV. It is extremely important for public and individual health for people with HIV to get tested at the earliest opportunity, start timely treatment, and stay on treatment. This all hinges on having a good relationship with their doctor or health care provider. Forcing doctors and health care providers to reveal private health information, or even testify about it, will have a negative impact on patient trust of the health care system and willingness to remain engaged in HIV care. The plain language in Sec. 2(5) would force any person charged under this statute to be tested for the identified viruses, or force the opening of their medical records for previous testing results. If a person with HIV accidentally vomits in the direction of a medical officer in a prison infirmary, they could be sentenced to five more years in prison. If someone accidentally sneezes in the direction of a police officer, a judge must grant a court order for their medical records and they may be subjected to involuntary HIV antibody and hepatitis B and C antigen testing if the police officer decides to press charges. An inmate who spits or vomits in the direction of a corrections officer, even without hitting or intending to hit the officer, can be forcibly tested for HIV and hepatitis and if found to have any of these viruses, charged with a felony. An adolescent with HIV or hepatitis held in a juvenile detention facility who spits while being restrained by a corrections officer, or while arguing with a guidance counselor, could wind up serving five years in an adult prison facility. State Senator Mike Gloor, who introduced the Bill.